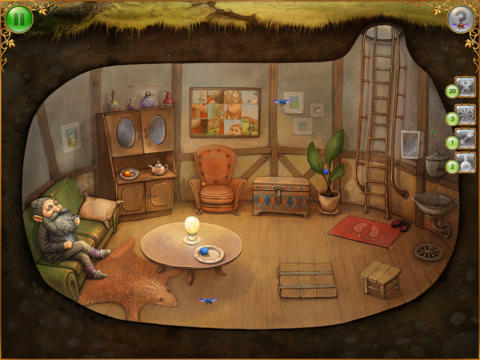 After reading Carisa Kluver’s great list of Five Great Puzzle Apps to use with kids 4-10, I was excited to try out the Tiny Bang Story app. I have a very popular monthly Saturday storytime called Donuts with Dad that often brings in a wide range of ages. This month’s story theme was “Teeny Tiny,” so the app was a good fit for the group and the theme, but I wasn’t sure how well a puzzle app would work in a storytime setting. In preparation for this demonstration, I played with it for a while the night before with my son (to make sure I knew how it worked) and really enjoyed working together with him on it. If I had heard about the app earlier, I would have preferred to have multiple sessions of playing it together with him before using it in storytime (and to test his long-term interest in and patience for the game—he’s not usually a sitting-still, puzzle-loving kind of kid, so if he can sit still and enjoy it, I feel confident recommending it! ), but since I’d only heard about it the day before storytime, I chose to trust Carisa’s recommendation. Integrating this app into storytime wasn’t quite as seamless as an ebook would have been, but I opened the game (note: it has a really long animated intro the first time you open it, so I let that play all the way through before storytime so we could get straight to the game), gave a brief demonstration (including having one of the kids in the room help me find one of the puzzle pieces that they spotted but that I didn’t see), and then I used the opportunity to talk about how apps can be used the same way that board games and big puzzles are–as a way for families to play TOGETHER! I explained that the puzzles were probably too difficult for most of the kids in the room to do on their own, but that with an adult and child working together, I thought it could work well for an even wider age range than 4-10. I had several parents come up afterwards to ask about the app (I’d forgotten to write the app name on my whiteboard like I usually do, but my mistake ended up being a nice way to gauge actual interest). I worried that (even more than usual, since I could really only show them a small teaser) talking about this app would feel like an advertisement in the middle of storytime—advertising a product that I cannot loan the listeners for free, and which some of them won’t even be able to access at home (although at least this one is available on both Apple and Android platforms). I’d like to think that my message about using apps together as a family activity was as strong a message as (or perhaps stronger than) my recommendation of this specific app, but I wonder if any other librarians struggle with this dilemma and if anyone has come up with an answer. Posted on January 20, 2014, in Apps, Story Time and tagged Carissa Christner. Bookmark the permalink. 1 Comment. Wonderful post Carissa! I know what you mean about worrying that an app recommendation (or even the mention of a specific app name) can feel like unintended advertising, especially when we don’t have the software on loan at our public library. This is a dilemma that will likely get more complex before we solve it, but it sounds like you handled it well. It’s really essential that we use concrete examples when we talk about new technology, especially when trying to model less obvious ways of using tech to bring families TOGETHER.